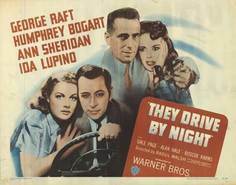 They Drive By Night reveals the tough, tight world of truckers, circa 1940. George Raft and Humphrey Bogart play the Fabrini brothers, Joe and Paul, who live in a world of long distance driving across the country’s winding roads, cozy diners, smart-talking waitresses, and the camaraderie of their fellow truckers. George Raft gives a solid performance as Joe Fabrini, who’s driven by his dream of owning his own truck one day, and answering to no one. Humphrey Bogart as Paul Fabrini, is more comfortable with his lot, yet would literally give his right arm in service to his brother’s dreams. Always one step ahead of frustrated bill collectors and the wrath of their bosses, the scrappy and wise-cracking Fabrini brothers are a popular duo on the road. Along the way, Joe meets a waitress, Cassie, (a lovely Ann Sheridan) who sparkles through his gritty world, slinging snappy backtalk and steak with the best of them. Gale Page delivers as Pearl Fabrini, the devoted wife of Paul, who is weary of seeing her husband drive off into the sunrise after a few scant hours of domestic bliss. Alan Hale, Roscoe Karns, and George Tobias round out the cast. Yet all eyes are riveted on Ida Lupino, who steals the show with her tour-de-force performance as bitter and ill-tempered Lana, who stops at nothing to get her man – in this case our boy, Joe. Whether carping about Joe’s clothes and lack of attention or sniping at her working class husband, Ed, Lupino hammers the point home that hell than no fury like a woman in heat who is ignored. The unforgettable moment comes during the climatic courtroom scene, which is strictly vintage Lupino all the way. This black-and-white pre-war 'noir-lite' classic, is skillfully directed by veteran Raoul Walsh (White Heat, The Strawberry Blonde, Sadie Thompson, What Price Glory). The screenplay by Jerry Wald and Richard Macaulay, moves along at a steady pace, full of good humor, drama, and thrills. And you’ll never look at an automatic garage door the same way again!